US President Donald Trump disbanded on Wednesdaty two White House business councils, amid growing criticism from and resignations from some CEOs from White House advisory boards for his remarks on Charlottesville protest. The two councils disbanded by Trump today were the Manufacturing Council and the Strategy & Policy Forum. The CEO of Campbell Soup Denise Morrison, who resigned from a White House jobs panel over Trump's remarks, said in a company release Wednesday, "Racism and murder are unequivocally reprehensible and are not morally equivalent to anything else that happened in Charlottesville. I believe the President should have been — and still needs to be — unambiguous on that point." Trump suggested in remarks Tuesday that the white supremacists and counter-protesters both blameworthy for violence that erupted this weekend in Charlottesville, Virginia. Morrison said the president's comments triggered her resignation from the manufacturing jobs panel. Morrison is the seventh person to resign from two major advisory panels this week following Trump's comments. Meanwhile, several leading members of Donald Trump's Republican Party and key ally Britain sharply rebuked the U.S. president on Wednesday after he insisted that white nationalists and protesters opposed to them were both to blame for deadly violence in the Virginia city of Charlottesville. Trump's remarks on Tuesday, a more vehement reprisal of what had been widely seen as his inadequate initial response to Saturday's bloodshed around a white nationalist rally, reignited a storm of criticism and strained ties with his own party. The Senate majority leader, Mitch McConnell, issued a statement that did not mention Trump by name but said "messages of hate and bigotry" from white supremacists, the Ku Klux Klan and neo-Nazi groups should not be welcome anywhere in the United States. Trump last week lambasted McConnell for the Senate's failure to pass healthcare legislation backed by the president, and did not dismiss the idea of McConnell stepping down. Ohio Governor John Kasich said there was no moral equivalency between the Ku Klux Klan, neo-Nazis and anybody else. A 20-year-old Ohio man said to have harbored Nazi sympathies was charged with murder after the car he was driving plowed into counter-protesters, killing 32-year-old Heather Heyer and injuring 19 others. 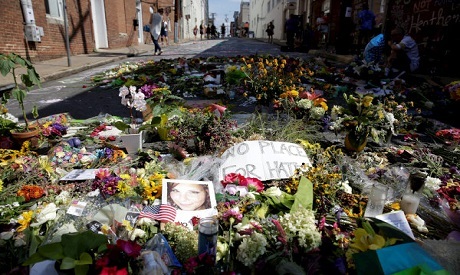 Heyer was being remembered on Wednesday at a memorial service in Charlottesville. Republican Senator Lindsey Graham, long a critic of the president, took direct aim, saying in a statement aimed at Trump, "Your words are dividing Americans, not healing them." Other Republicans to criticize Trump's remarks included former Massachusetts governor and 2012 Republican presidential candidate Mitt Romney and U.S. Senator Marco Rubio, also a Trump rival in the 2016 campaign. Republican former presidents George H.W. Bush and George W. Bush said in a joint statement: "America must always reject racial bigotry, anti-Semitism, and hatred in all forms." Senior U.S. military officers usually stay clear of politics, but two more of the U.S. military's top officers weighed in on Wednesday, without mentioning Trump. U.S. Army Chief of Staff General Mark Milley wrote on Twitter, "The Army doesn't tolerate racism, extremism, or hatred in our ranks. It's against our Values and everything we've stood for since 1775." Air Force Chief of Staff General Dave Goldfein said on Twitter that "I stand with my fellow service chiefs in saying we're always stronger together." Their comments followed similar ones from the top officers of the Navy and Marine Corps. White nationalists called the rally in Charlottesville to protest the planned removal of a statue of Robert E. Lee, commander of the pro-slavery Confederate army during the U.S. Civil War. Many protesters were seen carrying firearms, sticks, shields, and lit torches. Some wore helmets. Counter-protesters came equipped with sticks, helmets and shields. Trump's comments on Tuesday followed a statement on Monday in which he had bowed to political pressure over his initial response that talked of "many sides" being involved, and had explicitly denounced the Ku Klux Klan, neo-Nazis and white supremacists. Ronna Romney McDaniel, head of the Republican National Committee, said on Wednesday that Trump had simply acknowledged there had been violent individuals on both sides of the clashes in Charlottesville. But she assigned the blame to the white nationalists who mounted the rally, saying, "We have no place in our party for KKK, anti-Semitism ... racism, bigotry." Amid the fraying ties with his party, Trump planned a rally next Tuesday in Arizona, home state of two Republican U.S. senators, John McCain and Jeff Flake, who have been particularly critical of him. In a staff decision on Wednesday, Hope Hicks, a close aide to Trump, has been named as interim White House director of communications, temporarily taking the post left vacant after Anthony Scaramucci was fired last month, a senior White House official said.